Responding to student writing can be the toughest part of teaching First Year Writing / College Composition. This semester I spent a lot of time writing comments on paper-based texts. I got most of the students to hang on to my comments so they could turn them in with revisions. I do what I can to ask questions and give the students the sort of feedback that leaves them in charge of the draft. However, sometimes something is just wrong. For example, students sometimes italicize quotes. I feel pretty irritated when I give feedback along the lines of don’t italicize the quotes and then I get the revision and all the quotes are still formatted incorrectly. Yes, there are more important issues related to the students’ work, but I’m just giving you one example of how I spend a lot of time writing feedback that gets ignored. There’s a lot more that I could write here, but what I want is a way to track drafts. The problems I’m writing about today are related to giving feedback to student texts and following the revisions that students do. There is so much paperwork involved in saving drafts with my handwritten comments, and I think those comments aren’t doing as much good as they could. AND, I will still be faced with reading final DIGITAL portfolios with no access to previous drafts. I could take you through all that I have tried and thought about that doesn’t work very well, but why would you want to read about that? My online students do most of their writing on a blog. It’s a pain to either keep track of my thoughts until the end of their post or scroll down to the comments section every time I have a thought. A former professor of mine named Sam Watson used to type his students a letter after reading their work. There’s a lot pedagogically sound about this I think, but many students need examples such as how to write a transition or handle a quote. I see quite a few possibilities for how I might navigate these problems but none of these solutions has everything I want. From what I understand, Book Country is a Penguin community where those who read and write genre fiction can come together and respond to each other’s work. I cut off the name of the writer’s work I copied here. I hope if you’re from Penguin and come across this, you’re glad I’m sharing your community with readers. If not, I’m happy to take this screen shot down. What I really like about the Book Country set up are the boxes on the right. I can read the text and just write comments off to the side. I think there is also the potential for the writer (or possibly the teacher) to customize what kind of feedback they are asking for. This could put the writer more in control of the text, or if you prefer, you could think about those boxes in terms of a rubric or objectives. We use Digication ePortfolios at St. John’s. I could have students upload a file to their portfolio. I could download the file to my computer and give feedback via the Word commenting feature. When I give feedback that way, I’m careful to save feedback as a pdf file so the student doesn’t just leave some of what I’ve written in the draft. The student would upload revisions and we’d both have access to all the drafts. I’m not crazy-excited about all that uploading and saving or all the drafts I might have open on my computer screen at the end of the semester as I try to track what the student has done in the way of revision. There’s Google Drive, used to be Google Docs. I could access the student’s writing via a link. I type in comments/feedback, but then what happens? Can the students comment there too? Do we have to do our commenting off to the side? Will we be able to track drafts? How complicated is that? I want to navigate the cycle of write, comment, revise, and collect to be managed digitally next semester. Can you give me some feedback on my ideas? Do you have a great system I need to learn about? 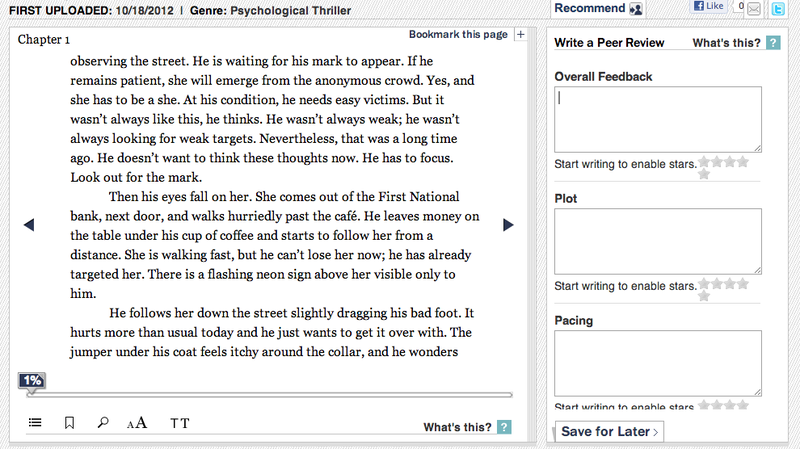 This entry was posted in teaching, Torg Life and tagged A Writer Teaches Writing, Book Country, engchat, English, feedback, fycchat, Google Docs, Google Drive, google+, language arts, NCTE, Penguin, revision, student writing. Bookmark the permalink. I’ve done tons of marginal notes. I’ve written long and involved letters. I’ve typed into their drafts (in another color and/or italics) the comments I want to make. The most positive feedback I have gotten from the students was on a short email I sent on final versions which were written in class to prepare for the final. I gave them their grade and told them two good things they had done and mentioned one problem. The most useful responses, though? That I am not sure about. Google Drive has a feature called ‘See revision history’. If the student shares the document with you and gives you ‘can edit’ permissions, you should be able to use this. You might have to have ‘owner’ permissions, but I believe ‘can edit’ is enough to be able to use this. When you have the document open, go to File -> See revision history. Alternatively, you can use the keyboard shortcut Ctrl+Alt+Shift+G.